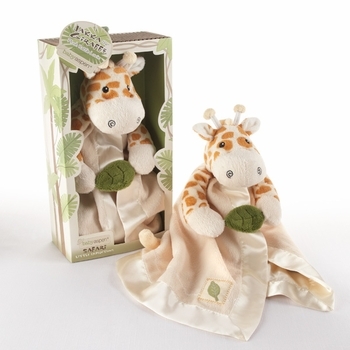 Presented in a jungle styled gift box, this fun loving plush giraffe blanket will keep baby entertained and stimulated! This unique security blanket features a plush giraffe sewn into the center. This little giraffe has some interesting characteristics adding to his appeal and intrigue. Aside from the accurate colors and details, he features various textures along with rattle and crinkle sounds. The various plush and satin materials with embroidered details add to the tactile stimulation of this cute jungle inspired playtime friend. The blanket is also easily surface washable and the giraffe measures 15 inches tall.